Come dine with us at Riviera Country Club! We feature full breakfast and lunch menus every day, and a delicious dinner menu each Friday and Saturday evening during the season. Reservations are strongly suggested. 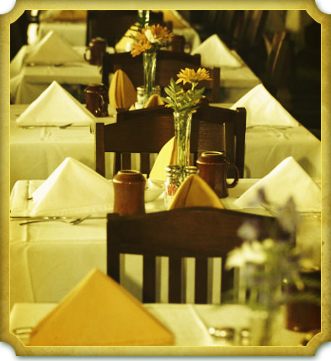 Please call us at (386) 333-9534 to reserve a table for your party. Join us for dinner on Friday and Saturday evenings, 5pm to 8pm. Enjoy 2 for 1 drinks with dinner or kick back, relax and enjoy Riviera’s Famous 19th Hole “Dungeon” anytime. Breakfast is served from 6:30am until 11:00am. Lunch is served from 11:00am until 3:00pm. Dinner is served from 5:00pm until 8:00pm on Fridays and Saturdays. Dinners served during the months of October thru April only.